Tiny Nassau is the sister island of Pukapuka 88 kms (55 miles) north west, and it's the only one of the Northern Group without a lagoon. It's always belonged to neighbouring Pukapukans who call it Motu Ngaungau which means Lonely Island. There's some doubt about the first discoverer, but it generally thought to be French Captain Louis Coutance of the ship Adele in 1803. The island is 9 metres (28 feet) above sea level, and just 11 degrees below the equator which means days and nights are almost exactly 12 hours long. The daytime temperature also stays at about 27 degrees celcius (83F) all year. Families live in thatched cottages called kikau (left). The only concrete buildings are the government offices (above centre) and the church (right). The village (it doesn't seem to have a name) is on the northwest where the reef is narrow and small boats can land when the seas are kind. The island also has solar panels which supply electricity for refrigerators, freezers, lights, water pumps...and a washing machine. Asian fishing boats visit occasionally...and illegally. They don't bother going through the official ports of entry and islanders never openly acknowledge the visits. But evidence of them is everywhere. Korean fishing floats, Japanese jewellery and canned goods are the signs. And David Stanley in his South Pacific Moon Handbook says "the children of these encounters also add an exotic element to the local population". 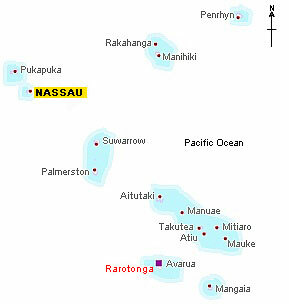 Nassau orginally belonged to the islanders of Pukapuka and was called Te Nuku-o-Ngalewu which means LAND OF NAGELU after the Pukapukan who was put in charge of it. When the two islands fell out with each other, it was renamed DESERTED ISLAND (Te Motu Ngaongao) supposedly by the islanders of Manihiki who drifted to the island and found it deserted. In 1803, it got yet another name - ADELE ISLAND - after the ship of the first discoverer. About 20 years later it was renamed LYDRA ISLAND by another explorer, then RANGER ISLAND after the London whale ship "Ranger". An American whaler May Mitchell decided in 1834 that it should bear his name and called it MITCHELL ISLAND. But it wasn't until a year later it that it finally got the name it's known by today. Another American whaler, John D. Sampson named it after his vessel, the NASSAU. It's not known why that name finally stuck, especially as another whale ship which sighted the island the following year tried to rename it NEW-PORT ISLAND! Australian born author and internationally famous former comedienne, Pamela Stephenson is one of very few outsiders to have visited Nassau, and hers is the most recently published account (2004). In her fascinating and superbly written book "Treasure Islands" she says that most residents have never seen a white person, other than in pictures. Her first impression was about the reticence with which she was greeted: "I was taken aback the people generally did not move towards me, but continued sitting, one group gathered under a palm-thatched boatshed, and the other around a man on a motor scooter who turned out to the be the chief". 'The people are shy,' said Poila (who guided her ashore). 'we don't get many visitors.'" And she tells how she was "utterly thrilled" to see people carrying on life as they had for decades: "Here a man was shaving a coconut to make coconut cream, there a woman was weaving dry palm fronds to make thatch for her house". Probably the most extraordinary sight on Nassau is the remains of the Tonga registered cargo ship, Manuvai which was wrecked on the island on 28 December, 1988. Tony Probst from California kindly provided these pictures, and he tells me that the ship ran aground on the reef when the crew fell asleep in the early hours of the morning. The vessel was holed during attempts to refloat it, and soon after a cyclone lifted it up and it landed upright in the middle of the island where it remains to this day...rusting among the palm trees. The tainted apple in this 'Garden of Eden' is flies. There are thousands of them all year round. And I'm told it's not helped by the fact that there a large piles of rubbish which the islanders only bury or burn every month or so. ISLAND CLOSED: COME BACK LATER! Now this one I've never been able to confirm, but I have been assured it's true...Don't bother visiting Nassau in July. That's when a ship picks everyone up, stops at Pupapuka to offload thosuands of taro plants and continues to Rarotonga for the annual constitution celebrations. All the buildings are boarded up and the island is deserted for two months. Nassau was bought by the Cook Islands Administration in 1945 for UK£200 and then sold to the Island Councillors and Chiefs of Pukapuka six years later for the same price. Cyclones are a fact of life in this part of the world. One of the worst was as recent as 2005 when Cyclone Percy hit Nassau and Pukapuka head on causing widespread damage.